Produced by Joe Henry and engineered by Ryan Freeland, “All the Things That I Did and All The Things That I Didn’t Do” was recorded in October 2017 in the Sun Room at House of Blues Studio in Nashville. Musicians who joined them there included Brittany Haas on violin and mandolin, Paul Kowert and Dennis Crouch on bass, Jay Bellerose on drums, Levon Henry on clarinet and saxophone, Nat Smith on cello, Pat Sansone on piano and Hammond organ, and Russ Pahl on pedal steel and other guitars. Mixed by Pattengale, the album was mastered by Kim Rosen. Pattengale talks about Django Reinhardt and Duke Ellington, while Ryan remembers listening to Crosby Stills and Nash as a child. In separate conversations, each mentions their distinct songwriting sensibilities. “Joey and I famously have an adversarial relationship, and that did not abate when it came to choosing songs for this record,” Pattengale says, suggesting that producer Henry was perhaps the only person they would both welcome to referee the process. Along with song choices, they have publicly needled each other over everything from geography to wardrobe selections. They relegate that side of their collaboration to repartee, on-stage and off. But inside the songs themselves, they make room for one another. “Sometimes in singing, we’ll switch parts for a beat or a bar or a note,” Ryan says. “And things start to obfuscate what is the melody and what is the supporting part.” A third presence rises out of their combined voices. By bracing that language with a band and rejecting boundaries around what musical tradition their harmonies belong to, “All The Things That I Did and All The Things That I Didn’t Do” draws listeners to the banks of a known river and then sings them out onto the open sea. Two-time GRAMMY® Award-nominated band The Milk Carton Kids have announced plans for a North American fall headline tour where they will be joined by special guests, The Barr Brothers. Additional dates will be added soon. Tickets for all newly announced dates go on sale this Friday, May 18. The Milk CartonKids’ upcoming schedule includes a number of additional summer headline shows as well as festival appearances at such gatherings as Pasadena, CA’s Arroyo Seco Weekend, Calgary Folk Fest and Rocky Mountain Folks Fest in Lyons, CO. For updates and ticket information, please visitwww.themilkcartonkids.com. “Big Time” follows the release last month of the project’s unprecedented centerpiece, “One More For The Road.” An epic 10 minute-plus musical excursion through folk, jazz, psychedelia, and back again, the landmark track earned immediate attention from NPR’s Bob Boilen, who wrote, “If this 10-minute-plus song is any indication, The Milk Carton Kids are about to release a truly epic album.” “One More For The Road” is available now for individual purchase and on all streaming services. Having spent much the last decade affirming themselves as among contemporary folk and Americana’s finest songwriters, musicians, and live performers, The Milk Carton Kids – a.k.a. singer-guitarists Kenneth Pattengale and Joey Ryan – ascend to even greater heights with ALL THE THINGS THAT I DID AND ALL THE THINGS THAT I DIDN’T DO. The duo’s most expansive and experimentally minded collection to date, the LP was recorded last October in the Sun Room at House of Blues Studio in Nashville, TN with GRAMMY® Award-winning producer Joe Henry ((Solomon Burke, Ramblin’ Jack Elliott, Carolina Chocolate Drops) and GRAMMY® Award-winning engineer Ryan Freeland (Ray Lamontagne, Bonnie Raitt). The Milk Carton Kidsonce again opted to push the envelope of their distinctive sound, this time crafting their first-ever LP to feature backing by other musicians. ALL THE THINGS THAT I DID AND ALL THE THINGS THAT I DIDN’T DO sees Pattengale and Ryan joined in the studio by a truly stellar lineup of top session players, including Russ Pahl (Kacey Musgraves, Blake Shelton) on pedal steel and other guitars, bassists Paul Kowert (Punch Brothers) and Dennis Crouch (Gregg Allman, Johnny Cash), Wilco’s Pat Sansone on piano, mellotron, and Hammond organ, drummer Jay Bellerose (Robert Plant & Alison Krauss, Elton John, Willie Nelson), cellist Nathaniel Smith (Sarah Jarosz, Abigail Washburn), Levon Henry (Blake Mills, Nico Muhly) on clarinet and saxophone,Live From Here with Chris Thile favorite Brittany Haas (Crooked Still, Dave Rawlings Machine) on fiddle and mandolin as well as Lindsay Lou and Logan Ledger lending additional vocals. Jun 05 2018 The Milk Carton Kids release new track "Younger Years"
Two-time GRAMMY® Award-nominated band The Milk Carton Kids have unveiled the latest track from their hugely anticipated fourth studio album, ALL THE THINGS THAT I DID AND ALL THE THINGS THAT I DIDN’T DO. Western influences on “Younger Years” gallop over a snaking clarinet and under vocals looking for something to salvage from sorrow (“Love inside our hearts / is the only kind of savior we’ve been sent”). “Younger Years” is available today at all DSPs. The Milk Carton Kids are currently poised to embark on an epic North American headline tour – their first ever trek featuring their full band. The dates – which include support from The Barr Brothers – begin October 11th at Asheville, NC’s The Orange Peel, and include stops at Brooklyn Steel (Brooklyn, NY), The Wilbur Theatre, (Boston MA), The Danforth Music Hall (Toronto), Lincoln Theatre (Washington DC), The Showbox, (Seattle, WA), The Wonder Ballroom (Portland, OR) and many more, with additional cities being announced shortly. In addition, The Milk Carton Kids’ upcoming schedule also includes a number of summer headline shows including Denver’s Botanic Gardens, as well as various festival appearances where they will share the stage with artists including Robert Plant, Neil Young, Jack White, Shakey Graves, Regina Spektor, Margo Price, Jeff Tweedy, and more. For updates and ticket information, please visit www.themilkcartonkids.com. The upcoming live dates follow The Milk Carton Kids’ acclaimed appearance at last month’s all-star “Tomorrow is a Long Time: Songs From Bob Dylan’s 1963 Town Hall Concert” in New York City, joining such fellow Dylan fans as Bill Murray, Steve Buscemi, Laurie Anderson, Mark Kozelek, Peter Wolf, and Triumph the Insult Comic Dog (who teamed with the duo for a hilarious routine segueing into “Pretty Peggy-O”). The MilkCarton Kids’ magical acoustic rendition of “Blowin’ In The Wind” earned widespread media attention from high profile outlets including Billboard, Brooklyn Vegan, SPIN, Stereogum, and Variety. “Big Time” followed the release of the project’s unprecedented opus, “One More For The Road.” An epic 10 minute-plus musical excursion through folk, jazz, psychedelia, and back again, the landmark track earned immediate attention from NPR’s Bob Boilen, who wrote, “If this 10-minute-plus song is any indication, The Milk Carton Kids are about to release a truly epic album.” “One More For The Road” is available now for individual purchase and on all streaming services. Two-time GRAMMY® Award-nominated band The Milk Carton Kids have debuted their hugely anticipated fourth studio album, ALL THE THINGS THAT I DID AND ALL THE THINGS THAT I DIDN’T DO. The album is streaming in its entirety exclusively via NPR First Listen, which wrote, “the band’s core ingredients – not to mention a gift for warm, intricate songcraft – render The Milk Carton Kids practically irresistible.” ALL THE THINGS THAT I DID AND ALL THE THINGS THAT I DIDN’T DO – available for pre-order now at all DSPs – arrives at last on Friday, June 29. The Milk Carton Kids are currently poised to embark on an epic North American headline tour – their first ever trek featuring their full band. The dates – many of which include support from The Barr Brothers – beginOctober 11 at Asheville, NC’s The Orange Peel, and include stops at Brooklyn Steel (Brooklyn, NY), The Wilbur Theatre, (Boston MA), The Danforth Music Hall (Toronto), Lincoln Theatre (Washington DC), The Showbox, (Seattle, WA), The Wonder Ballroom (Portland, OR) and many more, with additional cities being announced shortly. In addition, The Milk Carton Kids’ upcoming schedule also includes a number of summer headline shows including Denver’s Botanic Gardens, as well as various festival appearances where they will share the stage with artists including Robert Plant, Neil Young, Jack White, Shakey Graves, Regina Spektor, Margo Price, Jeff Tweedy, and more. They have also confirmed an appearance at this year’s Americana Fest on September 13 at The Cannery alongside OTHER ARTIST NAMES in Nashville, TN. For updates and ticket information, please visit www.themilkcartonkids.com. “Big Time” followed the release of the project’s unprecedented opus, “One More For The Road.” An epic 10 minute-plus musical excursion through folk, jazz, psychedelia, and back again, the landmark track earnedimmediate attention from NPR’s Bob Boilen, who wrote, “If this 10-minute-plus song is any indication, TheMilk Carton Kids are about to release a truly epic album.” “One More For The Road” is available now for individual purchase and on all streaming services. 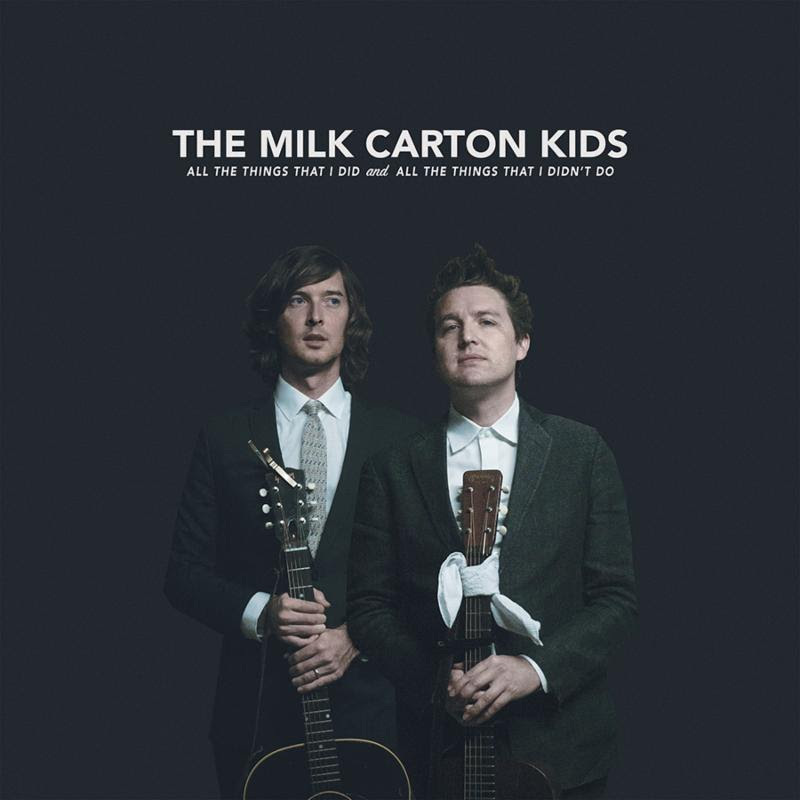 Two-time GRAMMY® Award-nominated band The Milk Carton Kids have released their new album, ALL THE THINGS THAT I DID AND ALL THE THINGS THAT I DIDN’T DO, today. The album was streaming in its entirety exclusively via NPR First Listen last week and has been receiving accolades across the board. ALL THE THINGS THAT I DID AND ALL THE THINGS THAT I DIDN’T DO is available now at all DSPs. Having just performed at the acclaimed Arroyo Seco festival in Pasadena, CA, this past weekend alongside Robert Plant, Neil Young and Jack White, among many others, The Milk Carton Kids are on tour now with a full band for the first time ever and will embark on an epic North American headline tour in October. The dates – many of which include support from The Barr Brothers – begin October 11 at Asheville, NC’s The Orange Peel, and include stops at Brooklyn Steel (Brooklyn, NY), The Wilbur Theatre, (Boston MA), The Danforth Music Hall (Toronto), Lincoln Theatre (Washington DC), The Showbox, (Seattle, WA), The Wonder Ballroom (Portland, OR) and many more, with additional cities being announced shortly. In addition, The Milk Carton Kids’ upcoming schedule also includes a number of summer headline shows including Denver’s Botanic Gardens, as well as various festival appearances where they will share the stage with artists including Regina Spektor, Margo Price, Jeff Tweedy and more. They have also confirmed an appearance at this year’s Americana Fest on September 13 at The Cannery in Nashville, TN. For updates and ticket information, please visit www.themilkcartonkids.com. All The Things That I Did and All The Things That I Didn’t Do. Recorded in a live, minimal setting at Layman Studios in Nashville, the “Younger Years” video displays The Milk Carton Kids’ evolution from a folk duo to full 7 piece band. All The Things That I Did and All The Things That I Didn’t Do is streaming now at all DSPs. The Milk Carton Kids will embark on an epic North American headline tour in October including headlining shows at NYC’s Brooklyn Steel, Chicago’s Thalia Hall and LA’s Ace Hotel. For complete ticket information, please visit The Milk Carton Kids online. 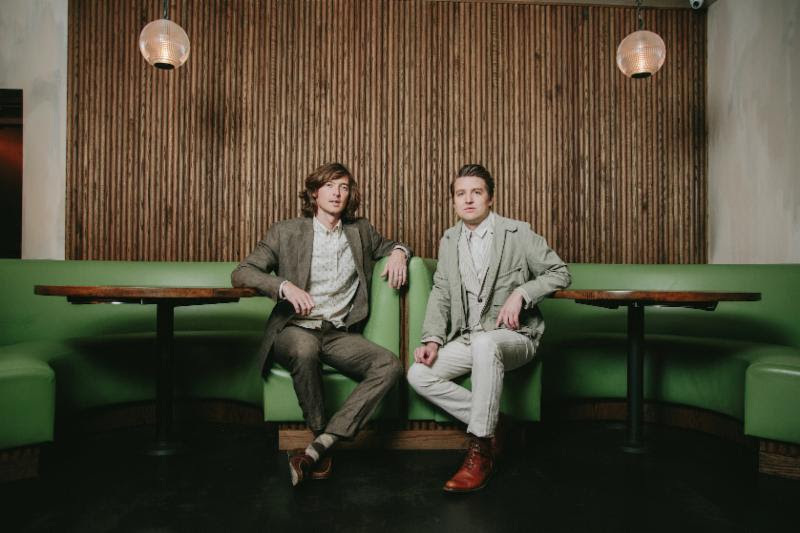 The Americana Music Association has named GRAMMY®-nominated duo Kenneth Pattengale and Joey Ryan of The Milk Carton Kids as hosts of the 17th annual Americana Honors & Awards show. The show is scheduled to take place at 6:30 PM (CDT) next Wednesday, September 12 at Nashville’s historic Ryman Auditorium and will also feature Musical Director Buddy Guy fronting an All-Star band including Don Was, Jerry Pentecost, Joe Pisapia, Ian Fitchuk, Lillie Mae, Josh Grange, Jim Hoke and the incredible McCrary Sisters. A live video stream of the 2018 Honors & Awards show will be webcast via NPRMusic.org. Additionally, CMT is set to broadcast a special featuring performance highlights on Wednesday, November 28 at 8:00 PM CST; followed by a special broadcast of the television series Austin City Limits on PBS in February 2019. Also being presented at the Honors & Awards show will be once-in-a-lifetime performances by legendary mainstays and trailblazing newcomers, showcasing the best and brightest from the community like k.d. lang, Buddy Guy, Irma Thomas, Rosanne Cash, John Prine, Robert Earl Keen, Brandi Carlile, Jason Isbell and the 400 Unit, I’m With Her, Nathaniel Rateliff & the Night Sweats, Margo Price, Lukas Nelson & Promise of the Real, Mary Gauthier, Anderson East, Lilly Hiatt, Tyler Childers and Courtney Marie Andrews. The Milk Carton Kids recently unveiled the music video for “Younger Years” from their latest album All The Things That I Did and All The Things That I Didn’t Do. Recorded in a live, minimal setting at Layman Studios in Nashville, the “Younger Years” video displays The Milk Carton Kids’ evolution from a folk duo to full seven-piece band. All The Things That I Did and All The Things That I Didn’t Do is streaming now at all DSPs. The Milk Carton Kids will embark on an epic North American headline tour in October including headlining shows at NYC’s Brooklyn Steel, Chicago’s Thalia Hall and LA’s Ace Hotel. Before the tour begins, the band will play a one-off at Americanafest on September 13 at The Cannery in Nashville. For complete ticket information, please visit The Milk Carton Kids official website. Following a triumphant appearance as hosts of the Americana Music Awards, and in the midst of a national headlining tour, The Milk Carton Kids performed “Younger Years,” “Big Time,” and “Mourning America” from their new album ALL THE THINGS THAT I DID AND ALL THE THINGS THAT I DIDN’T DO on CBS This Morning: Saturday. In an in-depth interview, The Milk Carton Kids tell CBS News’ Anthony Mason about the earliest moments of their career and describe how they found their sound. The Milk Carton Kids’ fourth studio album ALL THE THINGS THAT I DID AND ALL THE THINGS THAT I DIDN’T DO is available for streaming now at all DSPs. For more information about the record and tour dates, visit The Milk Carton Kids online. Nov 08 2018 THE MILK CARTON KIDS PERFORMED ON JIMMY KIMMEL LIVE! Having just finished their national headlining tour, The Milk Carton Kids performed “Younger Years,” and the title track from their new album ALL THE THINGS THAT I DID AND ALL THE THINGS THAT I DIDN’T DO on Jimmy Kimmel Live! last night. The Milk Carton Kids’ fourth studio album ALL THE THINGS THAT I DID AND ALL THE THINGS THAT I DIDN’T DO is available for streaming now at all DSPs. For more information, visit The Milk Carton Kids online.